This article is about the physical amiibo cards. For the digital collectible cards, see here. The packaging container for the cards. 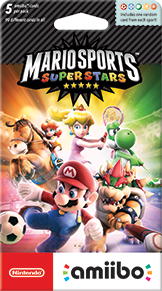 The following is a list of all amiibo cards in the Mario Sports Superstars line of amiibo. The cards were released alongside the main game, and first time purchasers of the game received a random amiibo card for free. There are a total of ninety cards; each of the eighteen playable characters in the game receive one card for each of the five sports. These cards are used to unlock the Star status for the character on the card, which powers up the character's stats. When three amiibo cards are tapped in, players unlock the Road to Superstar mode, where players can further strengthen characters by unlocking the Superstar status, which powers up stats more greatly than the Star status. amiibo cards can additionally be used to unlock gear for characters to use. These cards are only supported specifically for Mario Sports Superstars, thus do not work or recognized as a generic amiibo in most games. Another set of amiibo cards. The packaging for the amiibo cards. This page was last edited on January 25, 2018, at 13:23.